The drawings at the right simplify the physics of orbiting Earth. We see Earth with a huge, tall mountain rising from it. The mountain, as Isaac Newton first envisioned, has a cannon at the top. When the cannon is fired, the cannonball follows its ballistic arc, falling as a result of Earth's gravity, and it hits Earth some distance away from the mountain. If we put more gunpowder in the cannon, the next time it's fired, the cannonball goes halfway around the planet before it hits the ground. With still more gunpowder, the cannonball goes so far that it never touches down at all. It falls completely around Earth. It has achieved orbit. If you were riding along with the cannonball, you would feel as if you were falling. The condition is called free fall. You'd find yourself falling at the same rate as the cannonball, which would appear to be floating there (falling) beside you. You'd never hit the ground. Notice that the cannonball has not escaped Earth's gravity, which is very much present -- it is causing the mass to fall. It just happens to be balanced out by the speed provided by the cannon. Raise It Up (the mountain) to a high enough altitude so that Earth's atmosphere isn't going to slow it down too much. In practical terms you don't generally want to be less than about 100 miles above the surface of the Earth. At that altitude, the atmosphere is so thin that it doesn't present much frictional drag to slow you down. Accelerate It until it is going so fast that as it falls, it just falls completely around the planet. At that speed, it takes about 90 minutes to complete one orbit (an hour and a half to go all the way around the Earth!). At that speed, you can show that it takes 24 hours to orbit the Earth. But since the Earth is rotating once every 24 hours, the satellite is going around the Earth at the same exact rate that the Earth is turning. The satellite stays above the same point on the Earth, or looking at it from the Earth's surface, the satellite stays in the same place in the sky. This is called a "geostationary" orbit, since the satellite seems to be stationary - it looks like it doesn't move! This is great if you have to point your satellite dish to pick up a signal from this satellite. Point it once and you're done. 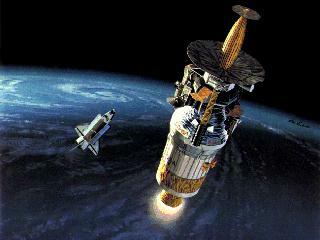 How does a satellite get from low earth orbit (where the shuttle lets go of it) to geosynchronous orbit? Elliptical Orbits: most orbits are not perfectly circular. All orbits are ellipses (flattened circles) with a high point (apogee) and a low point (perigee). At apogee, when the satellite is farthest from the earth, it is going the slowest - it's ready to fall back toward the earth. As the satellite falls it gains speed, and "overshoots" the earth, swinging quickly through perigee, then gaining altitude back toward apogee. The satellite doesn't stay in orbit at the apogee distance because it isn't going fast enough when it reaches that point. It doesn't stay in orbit at the perigee distance because it's picked up so much speed by that point that it starts climbing again. If we speed the satellite up while it's in low circular earth orbit it will go into elliptical orbit, heading up to apogee. If we do nothing else, it will stay in this elliptical orbit, going from apogee to perigee and back again. BUT, if we fire a rocket motor when the satellite's at apogee, and speed it up to the required circular orbit speed, it will stay at that altitude in circular orbit. Firing a rocket motor at apogee is called "apogee kick", and the motor is called the "apogee kick motor". Gimme More! Orbital Mechanics Web Page an outstanding reference!